December | 2014 | Small Farmers. Big Change. The following post was written by Dana Geffner, Executive Director of the Fair World Project. 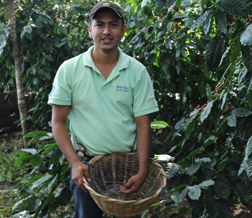 The post was sent to us from Nicaragua where she is visiting Fair Trade co-operatives. We leave Granada and drive a few hours through a beautiful lush landscape, horses and cows line the side of the roads, people selling honey and fruit as we make our way to Boaco, in the central part of Nicaragua. We are on our way to visit one of Equal Exchange’s coffee co-op partners to learn more about how small-scale coffee farmers are organizing in order to compete in a difficult global market that favors multi-national corporations working with large coffee estates that have access to capital, can take advantage of economies of scale and ultimately find it easier to reach the market shelves. We are visiting Tierra Nueva to learn why it is so important that small-scale farmers organize themselves so they can farm organically, stay on their land and feed their families. Read more here. The Non-GMO Labeling Project: Is something better than nothing? In today’s third and final piece on the Non-GMO Labeling Project, Sales Representative Gabriella della Croce offers us some thoughtful reflections on whether this particular labeling initiative is “better than nothing” for consumers who do not want to be consuming GMO products. We leave you with this question to ponder: Is something better than nothing, or does this initiative, with its good intentions, actually undermine other efforts which go so much further to keep consumers informed, educated, and healthy? As always, we appreciate your feedback and your views. Let us know what you think! “If I can’t afford to buy organic flour, should I bother paying for the Non-GMO verified seal?” When a good friend asked me this a few months ago, I told her that I didn’t think I knew enough about it to give her a thoughtful answer. Ever since then, I’ve been noticing the little orange Non-GMO butterfly seal everywhere, and trying to decide what I think. If organic prices are too expensive and your budget limits your options to conventional or Non-GMO, isn’t Non-GMO better than nothing at all? What about the millions of Americans who want to feed their families well, but can’t afford to buy organic? Yet in the rush to offer consumers more information, there seems to be some seriously careless rubber-stamping. I even saw Non-GMO Verified salt. This kind of marketing clearly fuels consumer’s confusion–and this salt is just one item on a long list of Non-GMO verified products that cannot possibly be genetically modified. On one hand I recognize and appreciate the value of offering shoppers the ability to avoid GMOs even if they can’t afford organic products. However, seeing the label used so irresponsibly leaves a bad taste in my mouth and strikes me as an opportunistic rush to take advantage of consumers’ ignorance. Grocery stores across the country are swamped with an alphabet soup of certification labels and dishonest marketing claims. There are six different seals all insisting that they guarantee Fair Trade. There’s the meaningless but popular term “natural,” plastered indiscriminately on just about everything. There’s organic, which means that 95% of ingredients must be organic and cannot contain GMOs. Now, on top of all this, there’s the Non-GMO Project butterfly seal. Perhaps by criticizing this label, I am pitting the mediocre against the good. It seems to me like many of the people who were involved in starting the Non-GMO Project have good intentions. Yet I worry that this seal undermines the much more comprehensive organic standard. I worry that it undermines the more ambitious state initiatives to label GMOs, rather than foods that don’t contain GMOs. Voluntary Non-GMO Labeling: A Party Worth Joining? On Monday, we heard from Jenica Rosen who raises important questions about the Non GMO Project. Jenica asks us to look into the companies that are supporting this initiative and consider their motives for doing so. Encouraging us to “follow the money,” she urges shoppers to dig deeper into any certification or labeling system and then make their own decisions about the products and the companies they support with their consumer dollars. Today, we hear from another Equal Exchange Sales Representative, Ellen Mickle, also based in our Portland, Oregon office. In her post below, Ellen reminds us that organic products cannot be certified as such if they contain GMO ingredients. Given this “gold” standard, she asks what, if any, value the Non-GMO labeling project adds in the market place. More concerning, Ellen questions whether the ever-increasingly ubiquitous butterfly seal might not be undermining the organic certification system, as well as attempts to enact legislation which would require mandatory labeling of foods containing GMOS (rather than voluntary labeling of those which do NOT contain GMOS). Finally, Ellen reminds us that many of the products which are showing up with the butterfly seal are on products for which there are actually NO GMO alternatives. Nowadays you can get your day started with Non-GMO Project Verified eggs, wheat toast and coffee – making it seem like industry, regulators, and consumers have united to carve out a brave new world in terms of our daily food choices. The only snag is; that world already existed. It’s called Organic, and this relatively new, voluntary Non-GMO Project Verified seal may be inadvertently undermining Organic, as well as attempts to enact legislation requiring mandatory labeling of foods containing GMOs. Consumer trepidation about consuming genetically modified organisms (GMOs), or “an organism that has been changed by injecting it with genetic material from another species” is at an all-time high, with 93% of consumers wanting the federal government to make GMO labeling mandatory. Commercial production and sale of GMOs in the U.S. began with a short-lived and much maligned “flavr savr tomato” in 1994, and currently nearly 75% of processed foods on supermarket shelves contain GMOs, mainly via the “big four” processed food superstars: corn, sugar beets, soy and canola. Consumers’ concerns about GMOs range from personal health to environmental pollution. Public concern is bolstered by a growing body of evidence that the technology is falling short of its promises, as weeds and pests evolve resistance to the crops that were engineered to out-compete with them. How did we get here? In contrast to the European Union, with member nations among the 65 countries requiring mandatory labeling of GMOs, the U.S.’s regulatory agencies overseeing the safety of GMOs (FDA, USDA, and EPA) do not employ the precautionary principle toward GMO regulation, which in environmental law has authorized regulators to “assess risk rather than wait for proof or actual harm.” In my estimation this is largely due to the FDA’s decision that flavr savr tomatoes required no testing or labeling because they’re “substantially equivalent” to Non-GMO tomatoes. There are myriad political, historical, and cultural factors behind why the U.S.’s path to regulating this technology differs from many developed countries. However, one cannot ignore the impact of the famous “revolving door” between regulators and industry. For example, Michael Taylor, current FDA Deputy Commissioner for Foods, also worked in FDA policy at the time the substantial equivalence policy set the groundwork for GMO regulation. Taylor then went on to work for Monsanto and a Monsanto-representing law firm in the intervening years before he returned to the FDA as Deputy Commissioner for Foods. To label or not? What’s behind the Non-GMO Project Verified Seal? If you shop at your local food co-op, Whole Foods, or a number of other natural food grocery stores you have probably seen this label. One of the newest seals in the marketplace, this one attempts to assure shoppers that the product does not contain GMOs (Genetically Modified Organisms). Unlike the mandatory GMO labeling laws which a number of states have been trying to pass at the polls, this initiative is seemingly noncontroversial. Who can find fault with the pretty butterfly hanging out in nature’s green pastures? Who could argue with an initiative that lets you know that the product is a wholesome choice for you and your family? Yet, what and who are really behind this initiative? Is it as pure and wholesome as the image and the colors of the blue sky and the green pastures would have us believe? Equal Exchange has of course been asked by some of our customers why we have not chosen to put this seal on our products (which are all free of GMOs). In order to educate ourselves, and our consumers, we have delved into the issue to better understand how this initiative came to be and who it potentially benefits and harms. After our latest lively discussion, several of our sales representatives were particularly motivated to do further research into different aspects of the issue. This week we will feature those opinion pieces. There are many reasons some consumers are choosing to avoid products that contain Genetically Modified Organisms, otherwise known as GMOs. For some, it is an issue with the severely negative environmental impacts—contaminating our water resources and destroying biodiversity within our ecosystems. For others, it is the concern for the health and wellbeing of farmworkers exposed to the dangerous herbicide, Glyphosate (used on Glyphosate tolerant GM crops), which seeps into their communities, and sometimes with lethal consequences. Others choose to avoid GMOs out of skepticism regarding the safety of GMO consumption and personal concern for their health. Whatever cause for avoiding them, the lack of stricter federal regulation and labeling of GMOs has created a need for another way to inform consumers of what is in their food. It was out of this need, it seems, that the Non GMO Project and their label, Non GMO Project Verified, were born. Those figures suggest some influence within the natural foods market and as with anything in this position, it is worthwhile for all of us as consumers to do our research, look deeper, and ask “what is this achieving and for whom?” While the answer will vary depending on your perspective, in some cases (such as the one described below) the evidence can be disturbing. I once had a professor who told us that if you want the truth, follow the money. Here in Oregon, we are still counting votes to settle whether or not Measure 92 for Mandatory GMO Labeling will pass. So, as you can imagine, there has been a lot of this “following the money” going on. And what has been found is that A LOT of money was pumped in from large corporate donors in an attempt to defeat the measure—and by “a lot” I mean over $20 million dollars. In addition to Monsanto and DuPont, some notable donors to No on 92 included Kellogg ($500,000), General Mills ($695,000), and ConAgra Foods ($250,000), to name just a few. So, why is this relevant to the Non-GMO Verified label? All three of the above listed donors also own swaths of the organic and natural foods industry, such as Kashi (Kellog), Cascadia Farm Organic (General Mills), and Alexia Foods (ConAgra); all three of which now carry many Non-GMO Verified products.